The Air Conditioning Contractors of Central Ohio is an independent non-profit trade association of heating, ventilation, air conditioning and refrigeration contractors. Representing the HVAC industry since 1906, ACCCO helps members acquire and satisfy customers while upholding the most stringent requirements for professional ethics, and advocating for improvements to the industry overall. 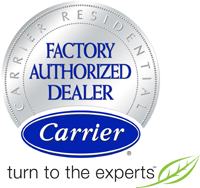 Factory Authorized Dealers are those that have met Carrier's highest standards for superior skills, service, and a promise of 100% satisfaction guaranteed. Carrier Factory Authorized Dealers must perform to rigorous national standards consistently and continually in order to qualify for factory endorsement. The Carrier President's Award recognizes Carrier dealers who exemplify leadership and management, customer satisfaction, expertise, business growth and operational excellence. This annual award is Carrier's highest dealer honor, and is designed to encourage self-analysis and reward individuals who have exceeded high expectations, not only as a Carrier dealer, but also as a Carrier Factory Authorized Dealer. Fairfield Heating and Cooling, Inc. is proud to be among the recipients of the prestigious Carrier President's Award for 2016, 2017 and 2018. The Lancaster Fairfield County Chamber of Commerce supports a prosperous business environment that enhances life in the region by providing value-added programs and services that contribute to members' success. NATE is the nation's largest non-profit certification organization for heating, ventilation, air conditioning and refrigeration technicians. NATE certification tests represent real-world working knowledge of HVACR systems and validate the professional competency of service and installation technicians.